Not Your Mother's Math Class: Happy New Year Deals for You! Happy New Year Deals for You! My friends an I have put together some great deals for all our followers! We each put one resource on sale for 50% for January 1st. Click here to the 30+ products that are part of this sale! 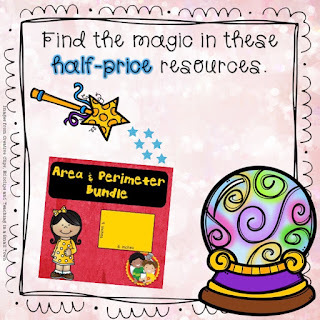 For this event I chose to put my Area and Perimeter Bundle on Sale. 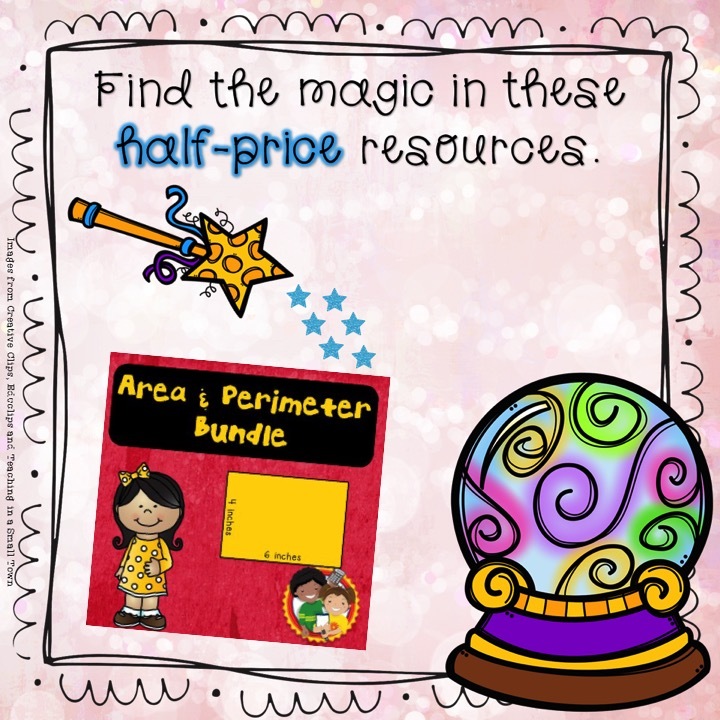 This bundle contains four resources that you can use in a variety of ways in your classroom: there are center games and printables for classwork or homework. Below you can see the 4 different products that are included in this bundle. You save $6.25 off the price of the individual products. If you don't teach area and perimeter don't fret; click here to see all the other deals. We have a great variety of subjects and grade levels. Task Cards are great for extra practice during math workshop or centers. Students can use them if they finish up something early or as part of your center rotation. The cards do get harder as you go; to differentiate you can assign students a certain number of cards. If you would like to play a game with your whole class and get your students moving, use these cards to play Scoot (one card per desk and have students move at a specified signal to the next card) or Solve Around the Room (with cards displayed in different locations). area of an irregular shape by decomposing it into rectangles – part done. area of an irregular shape by decomposing it into rectangles. These coloring pages are perfect for 3rd graders working on area and perimeter but can be used at other grade levels too. Students solve a problem on the page and check the coloring key, then they color the shape according to the key. One thing I love about these sheets is that the coloring part makes the assignment somewhat self checking. If students are not getting answers in the coloring key, they know something is wrong. I find this highly preferable to them completing an entire sheet incorrectly. Also, it gives students a chance to try solving a problem in a different way if they don’t get the right answer the first time. The pages in this packet are great for early finishers, class assignments or homework (if your students have crayons at home). There are so many options included that it makes it easy to differentiate! There are 24 student pages plus answer keys. Are you looking for a self checking center that your students will love? This packet contains 7 different sets of puzzles (6 matches per set) that you can use as your students learn more about area and perimeter or use them to differentiate your centers so your students are working on exactly what they need to practice. To hold your students accountable during centers, I've included sheets for them to record their answers and answer questions. Alternatively you could print the pieces in black and white (included) and have them paste down their matches. 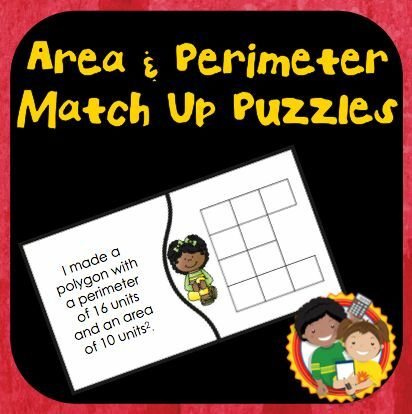 This packet contains 7 different sets of matching puzzle piece centers on area & perimeter. Each set has its own shape of puzzle so students are not just matching the shape, they must find the correct solution. I developed these centers because the ones that came with our math textbook kept the students busy but were not self-checking. Students were getting questions wrong and continuing on to complete more problems incorrectly. Those centers were not even designed with a student answer sheet for me to check. I felt like center time was not helpful or meaningful. I designed these Secret Code Centers to be self checking so students would know if they were doing something wrong. Students solve a problem and match their answer to one on the Answer Mat. If their answers are not on the mat, they need to try again. I had two students working on one of these centers and they were solving for perimeter instead of area. They knew something was wrong when they could not locate their answers. We were able to solve the problem very quickly. After making all the matches students use their answers to decipher a secret code (their favorite part). This also helps students stay on track and work hard to get the right answers since guesses will not lead to real words. This download contains 4 different math centers. Each center can be assembled into file folder games. Assembly directions with pictures are included. You can choose to print in black & white or color. I hope you find lots of good deals in our sales event to help you in your classroom for the new year!